1) If you're coming to a launch party, I've got you covered (if you RSVPed). No need to buy a book ahead because you'll get your copy there--signed, if you like! There's still room for guests, so let me know if you'll be coming: Tues 5/25, Thurs 5/27, Fri 6/4 (evening parties). Tues 6/8 (morning). 2) If you own a Kindle, I've loaded the book and Amazon tells me it should be available in 48 hours, which comes out to Sunday morning. 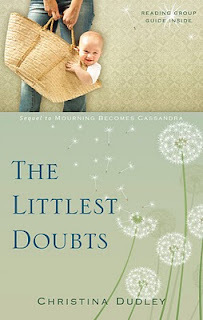 As a special bonus, THE LITTLEST DOUBTS will only cost $9.95 on Kindle because I don't have to pay for printing or shipping. If you own an iPad, you can read it on Kindle for iPad. If you own a Nook, forgive me--it should be available whenever Google Editions launches in June or July. B&N and iBooks require individual ISBN numbers to sell through them, and ISBNs cost $125 a pop! 3) You can buy the book NOW on my website, and I'll ship it to you Media Mail. Bay Area readers can also practice delayed gratification and wait until the California launch parties in August, dates TBD. 4) As with MBC, I'll be selling TLD like crack out of the back of the van. Catch me around town or at the church or a book event. See the Events on my website. 5) If you only do Amazon, you can place a pre-sale order, and the book will be shipped on or around June 9. Longer wait--it's called windowing. Since Amazon takes the heftiest cut, I'm trying to recover some costs before I open that channel. Same with the bookstore. 6) And finally, you can, of course, request it through your library system and get your hands on it in a couple months. Thanks for reading and for all your encouragement! Let me know how you like it. I'll have a margarita now just to get ready. Umbrella and book on June 8. So pumped!